Chicagoans know that there is no place like Chicago. The city offers so much including great restaurants, tons of shopping, different cultural experiences and a fun night life. One thing Chicago is well known for is its architecture. Creatively designed buildings give the city one of the most iconic skylines. Something that Chicagoans take for granted about the architecture is the doors. Chicago has some of the coolest, most interesting doors in the world. Each one gives a glimpse into the culture and identity of the city. While there are so many unique entryways, we’ve come up with a list of the 10 famous doors around Chicago you should check out. Spanning over 140 ears and 3 rebuilds, the Palmer House is a testament to Chicago history and one of the most famous hotels on Earth. It’s elegant lobby and large rooms attract many tourists each year. One of the Palmer House’s most popular features is the Monroe Street entrance, otherwise known as the peacock door. The beautiful bronze double door features a peacock with a stunning feather design. The doors were created by C.D Peacock, a jewelry store that’s last downtown location closed in 1993. The doors were originally their store’s entrance before being moved to the Palmer House. 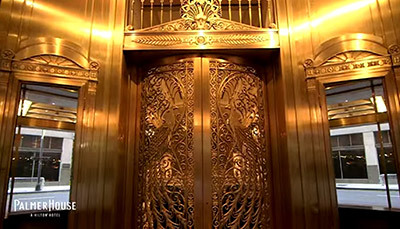 Today, hundreds of people each day marvel at the large bronze doors before entering the luxury hotel. The Fredrick C. Robie House was designed by Frank Lloyd Wright and was built between 1908 and 1910 in Hyde Park. 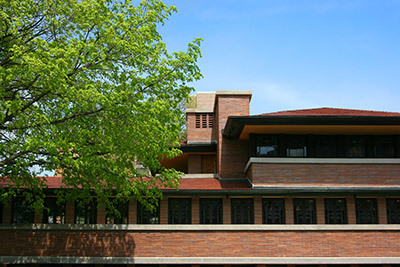 The Robie House was donated to the University of Chicago in 1963. It served as the headquarters for the alumni association. In 1997, the University of Chicago moved their offices out and turned over the building to the Frank Lloyd Wright Preservation Trust. The Robie House has since been restored to its original 1910 look. 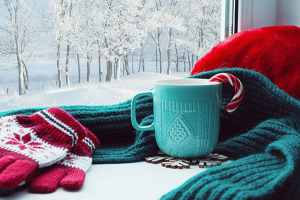 The walls are lined with doors and windows made from a leaded glass. 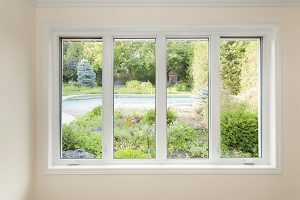 This showers the room in natural light. The doors have diamond and diagonal shapes across them which gives the building a unique look. 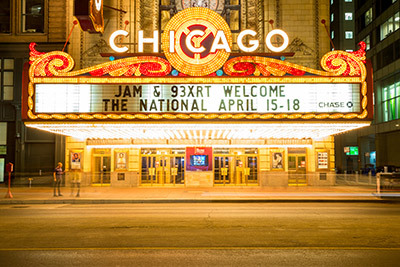 The Chicago Theater is the landmark theater of downtown. It was built in 1921 and is located in the north loop on the corner of State and Lake Street. It was originally known as the Balaban and Katz Chicago Theater. The entrance of the theater is something to behold. The doors are under a ritzy 1920s style awning which showcases the acts of the night. Above that is a large vertical sign that reads “Chicago”. At night, the awning and sign are lit brightly with hundreds – if not thousands – of lights. The doors of the Chicago Theater are bronze with a large pane of glass giving guests a glimpse within the theater. It feels like a very traditional theater. Together with the lights, it will give you the sensation that you’re about to enter a special place. The Monadnock Building is a skyscraper located in the Loop on Jackson Street. It’s used to house offices for many different companies. The north side of the building was built in 1890 while the south side was built in 1893. The two sides were constructed by two different groups. Burnham and Root did the north side while the south side was designed by Holabird and Roche. The Monadnock Building Receive mixed reviews from architects upon its original construction because they felt it was too extreme and lacking style. 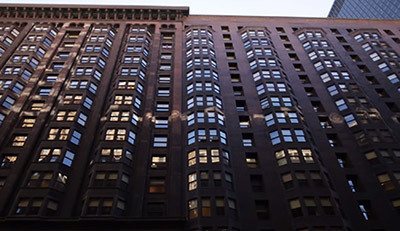 Since then, the building has become a Chicago Landmark and is credited with being a classic work of architecture. The doors of the Monadnock Building are tall and bronze. They have a large piece of glass that dominates more of the door. Above that is a large semicircle transom with a thick bottom beam that reads “Monadnock”. The Marquette Building, another Holabrid and Roche designed Chicago Landmark, was built in 1895. In 1979, it became a National Historic Landmark. It’s the first steel-framed skyscraper. 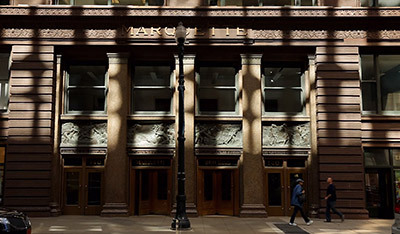 The Marquette Building was named after Jacques Marquette, the first European settler in Chicago. The Dearborn entrance (just north of Adams Street) has a set of double doors and a set of revolving doors. They’re made of bronze and have large panes of glass in the center. Above the doors are four bronze murals of Marquette’s journey though the Great Lakes region. The final slab of the mural shows a burial scene representing Marquette’s death. 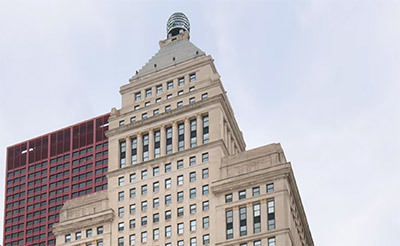 Designed by Gaham, Anderson, Probst and White, the Metropolitan Tower was built in 1924 on Michigan Avenue. It was the first building to exceed 30 stories in Chicago. The building is home to a branch of Chase Bank and luxury residential units. The front door isn’t the main attraction of the Metropolitan Tower though, it’s the elevator doors. They’re large bronze doors with moldings of different figures and influential scenes from different periods of art and scientific advancement. 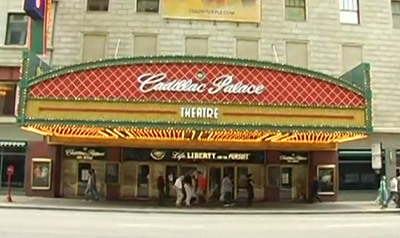 The Cadillac Palace, the second theater on this list, is on Randolph Street in the Loop and was built in 1926. It was originally an Orchestra theater called New Palace Theater. 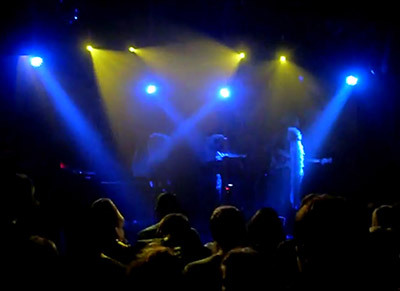 Then the name was changed to Bismarck Theater and was a rock music venue. Finally, in 1999, the theater was purchased by Cadillac and named the Cadillac Palace that shows Broadway hits. Much like the the Chicago Theater, the Cadillac Palace has a large, illuminated marque that showcases the name of shows playing in the not too distant future. The doors are also very similar to the Chicago Theater entrance – bronze doors with large windows in the middle. It comes together to give a 1920-1930s traditional theater look. Out of all the venues on this list so far, The Green Door Tavern is the only one that isn’t a Chicago Landmark. It’s exactly what the name implies: a bar with a green door. Built in 1872 as a grocery store, it’s now a popular destination for drinks, improv and entertainment with a vintage style setting. The door is just a green painted door. There isn’t anything visually appealing about it. Outside from the color, it’s rather ordinary. So why is it on our list? The history of green doors on bars goes back to the days of prohibition (1920-1933). 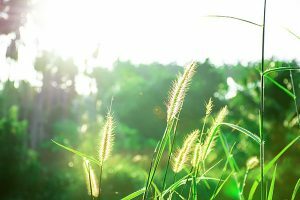 When there was a building with a green door, it signified that it was a speakeasy. In 1921, the Green Door Tavern went from being a grocery store to a restaurant with a green door. After the prohibition acts, there was no need to hide anymore and more bars removed their green doors. The Green Door Tavern didn’t though. 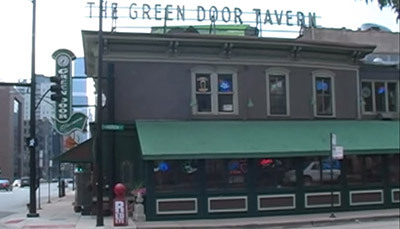 Even as the bar was bought and sold by different people, the green door remained as a part of Chicago history. The Powhatan is a 22 story luxury apartment complex on the south side of Chicago. It was built in 1922 and became a Chicago Landmark in 1993. It’s known for its art deco design. The east entrance of the Powhatan has an interesting set of double doors. They have designs of Native American Chief Powhatan on the glass of the door. Around his image are jagged lines and odd shapes. They make Powhatan’s image stand out more. Above the door is a large semicircle transom with another design made with thick black lines. The last door on our list isn’t an actual door. It’s the Double Door Music Venue in Wicker Park. The small hall opened in 1994 and showcased premier artists such as Smashing Pumpkins, Cheap Trick, Kanye West and The Killers. This staple of the Chicago music scene hasn’t had much good news lately. Since 2015, Double Door has been in jeopardy of being evicted from their location. That being said, they’re still there today and are fighting to remain in Wicker Park. 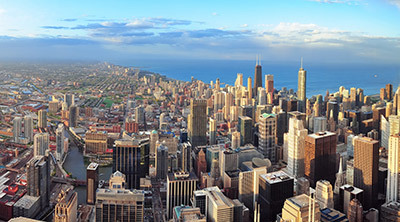 Chicago is a culturally rich city and that can be seen through its famous doors. 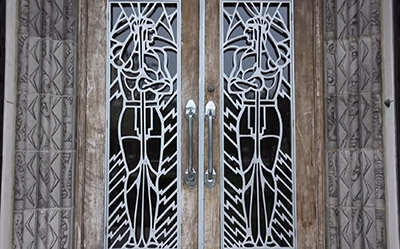 These 10 doors are only a small handful of beautiful and culturally significant doors found in Chicago. 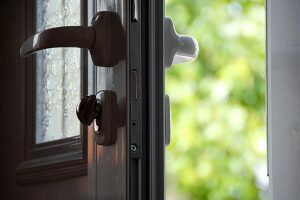 We recommend you check out these doors and to find more that we didn’t include in our list. You can learn a lot about Chicago history through them.